FOUR Wits students have created a library-style app to help their peers learn about human genetics. Mahtaab Hayat, Jorge da Rocha, Heather Seymour and Natalie Smyth, students from the Wits Sydney Brenner Institute for Molecular Bioscience (SBIMB), the Wits Division of Human Genetics (NHLS) and the Wits Human Genetics Community Outreach Programme (SCOP) in the School of Pathology, created the app, GenSCOP. SCOP was initially formed as a way for Wits students to interact and work with their community. The idea developed through teaching more schools about genetics because “kids are really interested … especially when it comes to bringing out real-life examples, their heritage,” said Smyth. GenSCOP was formed as an extension of SCOP to extend their reach to more students without the use of extensive resources. “We decided that an app is great because mobile phones are everywhere,” said Da Rocha, who came up with the idea to turn their presentations into an app. Smyth added that “making it a mobile app makes it more relatable to the generation below us”, due to the growing interest of schools in using information technology for teaching and learning. The app, even though it was created for high school students, can also be used by first-year university students to “wrap their minds around the basics of molecular biology”, said Da Rocha. Once downloaded, the app does not need data to function. “We are looking at how to translate it into different languages – our South African languages,” said Hayat. The team are also considering extending their reach to countries outside of South Africa, such as translating the app into French and Arabic, and adding more matric syllabus work for teaching purposes. 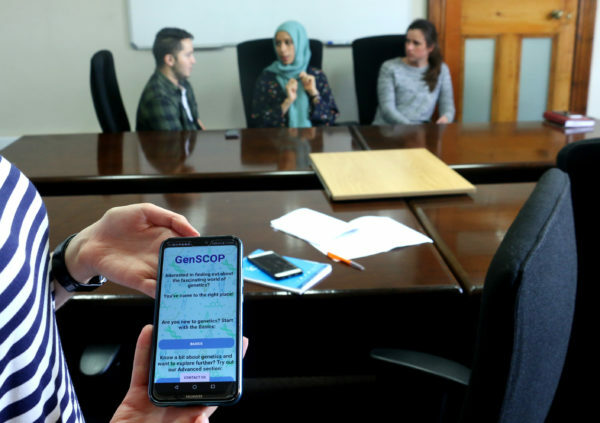 “This app has the potential to have wider impact across Africa, as the students market GenSCOP at the various conferences and research meetings that they attend nationally and internationally. They have received positive feedback,” said Ramsay. The app was officially launched in Kigali, Rwanda at the African Society for Human Genetics Conference on September 21, 2018. The app is available for download on Android.